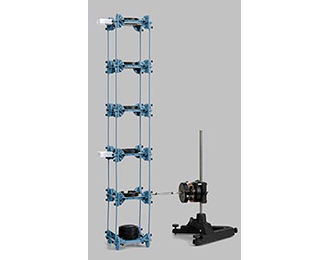 Explore resonance modes, measure accelerations with wireless sensors and demonstrate passive damping with this complete structures experiment. Built from PASCO Structures beams, this tower is made to oscillate in its various resonance modes by a driver attached by a rubber band to the first floor of the tower. Wireless Load Cells with Accelerometers are attached to each floor to record how much shaking each floor experiences. In the second part of the experiment, a damping pendulum is installed on top of the tower. In modern buildings, passive damping mechanisms are installed to damp out oscillations during earthquakes. The damping pendulum in this tower quickly stops oscillations.